This was a year of Tsunamis, real and tragic in Japan, and metaphorical too. I am struck by their coincidence in time, their accumulation over this period and by the fact that their impact remains a mystery to be uncovered in the years to come. 2010 and 2011 will be remembered for the rise and fall of Wikileaks or, at least, of its founder – I am persuaded that Wikileaks will survive the downfall of its creator. The vast amount of confidential information the site released into the public domain sent shockwaves around the world and generated sharp debates about national security and the benefits of an open regime of information. Interestingly, a number of human rights activists did not greet the phenomena as an advance for freedom, highlighting instead concerns about privacy, and possible retribution against those quoted in the leaked diplomatic cables. As is the case for many of the events of the last 12 months, there will be no fixed outcome or impact from Wikileaks. As we have all discovered, it is not a zero sum game but rather an open game whose rules and game plan are still being written as we “play” along. The identity of the players themselves can be surprising. For instance, democratic governments, including some such as the USA, that have very actively and openly supported internet freedom, in this year called for, and implemented, very punitive measures against those responsible for leaking information into the public domain. In the UK, in the aftermath of the London riots, the British government threatened introduction of a power to shut down social media at times of civil unrest. The Mexican government used anti-terrorism legislation to charge Twitter users with disinformation. While these may be knee-jerk reactions, they highlight how mercurial are the rules and policies adopted in response to the free flow of information on-line. In 2011, the cat and mouse game for control of the internet saw other governments pursue the “just-in-time” blocking of online content and social media applications during periods of unrest. Malawi’s government, for example, blocked access to news websites, Facebook, and Twitter in July as part of its clampdown on mass protests. Access to the internet was cut off entirely in Egypt amidst the January 2011 mass protests. Throughout the year, many debates about the internet were dominated by issues related to intellectual property rights (IPR) and on-line content. IPR has become the best known “secret” topic of negotiation and a major issue in behind the scene discussions on internet freedoms. Te latest report from the UN Special Rapporteur on freedom of expression presented at the Human Rights Council in June 2011 was not endorsed by a number of European countries (including the UK or France) because of its position on IPR. Of course the last 12 months will be remembered first and foremost for the Arab Spring – probably the biggest surprise of the year (or decade?). The Tunisian revolution started just as we were finishing our five year strategic plan. The uprising in Egypt came next to be followed quickly by uprisings around the Arab world (and beyond). Everyone I spoke to, including within a number of Ministries of Foreign Affairs, admitted that the Arab spring took them by surprise. Much has been written about how the world, including, to a large extent, Arab governments themselves, got the aspirations of the Arab people very wrong. There are few ready to pronounce on the outcome of the Arab spring: it was long in development and has long to run. For instance, as I write this, the initial enthusiasm in Egypt has given way to deep pessimism because of the very real possibility that country is moving back in time, retreating from the Tahir square demands to the stability aspirations of the Military regime. Aung San Sui Kyi was released on 13 November 2010, after years of house arrest, solitude and humiliation, but to a large extent Burma remains a closed society. Again, the process of transformation will not be smooth or linear. It no doubt will take many more years and many reverses and about-turns lie ahead before democracy sees the light of day in Burma. In the meantime, Indian and Chinese economic interests will very much determine the course of the political negotiations over the present and future of Burma. In 2011, Asia, led by China and India but joined too by Brazil, gained further influence in the world scene and claimed a deeper stake in international mechanisms such as the G20. They are now playing a critical part in international responses to the financial crisis which previously had been largely limited to Europe and the USA. These developments bear many implications for ARTICLE 19: they confirm the findings of our strategic plan and support our commitment to shift attention and resources towards these new global centers of power, including by investing in our work in Brazil, Mexico, Tunisia and India. But it may also carry financial implications with the possibility that funding currently available to us (including from the UK government) will decrease if not be stopped altogether should the global financial crisis not ease up. The growth of religious conservatism, and its active vying for global political influence, has generated significant tensions for free expression around the world, including in Western democracies. The draft bills and debates on full-face veils in France, Belgium and the Netherlands are some standout examples of this. Still, one place where these debates cooled during 2011 is at the UN, largely due to the US diplomatic skills and NGOs’ advocacy. But the struggle is far from over yet, just one of its latest expressions. A couple of weeks ago, on the occasion of its 10th anniversary, the world remembered 9/11 and reflected on its legacy. Human rights abuses, the sidelining of human rights standards, the introduction of myriad security-related laws and policies, restrictions on freedom of expression and media freedom imposed in the name of the war on terror: these are the human rights inheritance of the last decade. In response and since 2005, A19 has prioritised work on anti-terrorism legislation. Some 6 years later, I am struck by how “normal” these many abnormal standards have become. We no longer fight them as the aberrations of the war on terror but instead as structural characteristics of the world we inhabit, a world profoundly different from that of 2001. Looking forward, it is not “just” 9/11 of course that will define the way ahead. But 9/11 is embedded in our present as much as in our past. Its presence in our future seems inevitable. Indeed, the 10 years’ anniversary was marked by the introduction in many states of a number of new repressive measures taken in the name of security and anti-terrorism and marred by the continuing attack against the media and freedom of expression by armed groups. An interesting development of the last 12 months has been the number of initiatives to address violence against journalists and impunity. While not a new phenomena and while neither 2011 nor 2010 are the worse years on record, civil society, a number of governments and international agencies have prioritised the issue. Most recently, the UNESCO has organised a UN inter-agency meeting to agree a plan of action, while Austria, which just joined the Human Rights Council, has decided to make it a priority of its engagement at UN level. Another issue which has gained momentum at international level is that of repression against civil society and legal threats against charities around the world. The US government has made this one of their key priorities (along with internet freedoms), as reflected in the number of political statements on the matter by the highest level officials, and the large increase of grants to protect civil society activists. 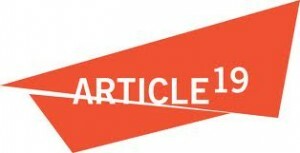 ARTICLE 19 has been an active participant to both developments, advising the various governments leading on these matters and participating to joint actions with other civil society organisation, such as the forthcoming Impunity Day.